I recently presented at Hackcon in Oslo Norway, and at IT-Defense in Cologne, Germany; on the subject of "Hacking Email Filtering Appliances and Solutions"
I briefly talked about some of the vulnerabilities I have previously found in Security Appliances, but talked in much more detail about recent research I have been developing for automated enumeration of email filtering services, products and policies (offensively, from the outside). Specifically, I talked about the enumeration techniques, and how this information could be used by malicious hackers to improve the efficiency of attacks against organizations. This type of automated reconnaissance can be combined with Phishing attacks and to quickly find and exploit vulnerable systems and users. Feedback from both these talks has been very good, and I am planning to release tools, and a white paper over the coming months. I have been developing MailFEET, an enumeration tool with defense in mind, to enable organizations to identify weakness in their email filtering solutions. I have tested this tool with hundreds of domains, to find some of the most common policy bypasses, and we have used these techniques with several of our customers recently to help them identify and close such loopholes. Most email filtering solutions do not block embedded executable code or scripts in office documents. Almost all companies tested had no filtering for common encrypted attachments (password protected office documents or zip files for example). A small but significant percentage of organizations had direct bypasses in their email filtering (i.e. in around 5% - 10 % of cases, it was possible to directly deliver to relays or mail-servers behind the filtering solution, by enumerating the relevant IPs from SMTP header information). MailFEET - Mail Filter External Enumeration Tool - For finding vulnerable email filtering products, and flaws or bypasses in email filtering policy (written in Python and SQLite) - This just needs tidying up a bit before release. DAPHT - Document and Archive Payload Hiding Tool - For automatically embedding test payloads in a variety of formats, to hide them from most email and web filtering solutions (written in C#). 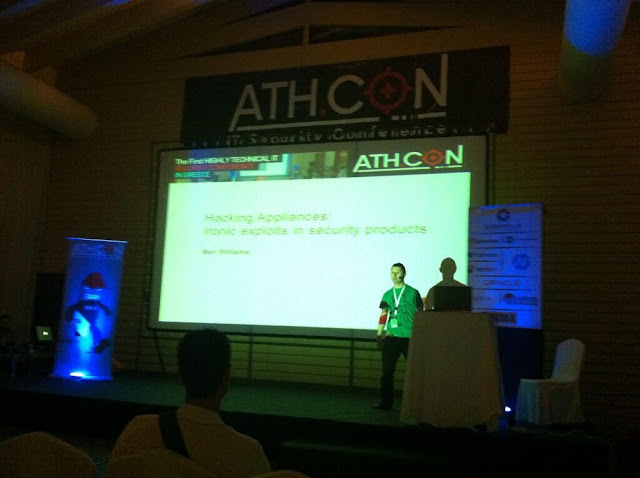 I am just on my way back from presenting at Athcon 2013 – the premier IT Security conference in Greece. It was my first time at Athcon, but I have to say that I was impressed. The organisers did a great job with the venue and facilities, and choosing speakers which had a great mix of content and technical depth. I presented my research on “Hacking Security Appliances” (which I have previously presented at BlackHat Europe, and Dublin Source earlier this year). That’s probably my last time presenting that particular material, as I want to keep things fresh and I'm currently working on various ideas I have for interesting new research. Athcon also had a “capture the flag” (CTF) competition hosted by Symantec (unfortunately I didn't get time to take part, but is seemed to be very popular). All in all a great conference that I would like to attend (and speak there) again. I am looking forward to speaking at BlackHat EU again on Thursday of this week as I will be talking on the subject of "Hacking Appliances: Ironic exploits in security products" which is an area of research I have particularly enjoyed. In short, I will be discussing some of the vulnerabilities I have escalated to various vendors of popular Security Appliances during 2012, and demonstrating how these vulnerabilities could be exploited in realistic scenarios. There will be some root shell, for those of us who like that sort of thing, but I think the most interesting aspect is that most of the vulnerabilities were typical OWASP Top 10 type issues, or other fairly basic misconfigurations, which could be found and exploited in a few days using typical attack techniques. People outside the Pentesting community find it surprising when I tell them that most popular Security Appliances I have looked at had fairly basic and rather easy to find vulnerabilities. Most of the products I looked at were popular and widely deployed, so the concerning thing is that companies using these products (and the vendors who produce them) were unaware that these products suffered from such issues. I showed some of these issues last year, I will be showing a few more during my talk on Thursday. Can Google really be used as a proxy server - to avoid detection?